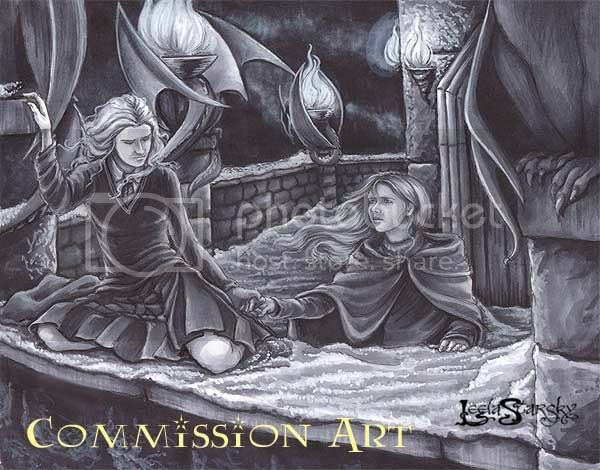 Holy illustration that should be printed and put in, like a Harry Potter RPG Adventure handbook or something. It's so lovely and you took into account so much. I LOVE the variations of forground, middleground and background; it adds so much depth! Those gorgeous pillars with the dragons curled around them look so real, like. This looks like a screencap from a movie or someting. The grimness of the girls is so mournful and the grey wash totally accentuates that. Poor Luna! The snow looks so textured and...snowy. Wah. Thanks! I was actually surprised (and happy) at how 'snowy' the snow ended up looking. Don't you wish they'd publish a book of fanart? I reckon it would sell surprisingly well! This page was loaded Apr 25th 2019, 12:42 pm GMT.